Well…I was invited to exhibit work in a woman’s show a month ago. The deadline is this Saturday. One might be thinking, “Yippie! You’ve been invited to exhibit!” However there are limitations placed on what you can display in a show: It has to be framed a particular way; made in the last two years; and must not have been shown at the gallery before. *SIGH* Again, one might be thinking, “No big deal.” However, it is. For me it is a big deal to have only been given a month to prepare two pieces for display. I’ve also been thinking a lot about how art is produced, displayed, sold and how artists are treated. We are often expected/required as part of our business to enter shows: shows that require us to pay an entrance fee. The fee is usually at least $20. Now does that make any sense at all? Artists have to PAY so the public can look at their artwork for FREE? Shouldn’t the public pay the artist to look at the artwork? Wouldn’t you pay a quarter to enter a gallery to look at the art? Well…maybe not. My cynical nature causes me to speculate that most people would be more interested in spending their quarter on useless, cheap, plastic stuff made in China at some unmentionable big-box store. Now, we must also remember that the gallery takes a large percentage–usually at least 40%–of each sale and, if any of you have ever had a piece of artwork archivally framed, you know how expensive it is: often more than you paid for the artwork. Fortunately, I’m very good at framing my own artwork right down to making the frames from actual trees (with dad’s help, of course), but it’s still expensive and time-consuming (and frustrating when a corner does not match up perfectly, the glass breaks and/or you have to take the whole thing apart for the umpteenth time because of some minute speck of dust (Now you know why all picture framers are neurotic. Please be patient with us. We’ve had a hard day.).). My point here is not to say that galleries do not deserve a commission or that artwork should not be properly framed. It is, simply, that art is expensive for a good reason: quality materials, time, mark-up, and craftsmanship. Also, there has got to be a better way for the community to support artists. OK, back to the show…so I have to create two pieces in a month…OK, in reality, I’ve given myself a week. Oh, the insanity of it. What have I created in the last two years that could be displayed in a gallery? Hand-knit socks? Skirts? Dresses? Cheesecake? Of course these things are highly creative (yet under-rated) and take great skill to accomplish (especially when you’re like me and cannot possibly follow a pattern/recipe to a tee: if I even use a pattern/recipe.) On one hand, these are perfect things to display at a woman’s show. On the other, I’d have a hard time convincing anyone that these things are fine art (maybe if I made breast-shaped cheesecake or displayed the socks in a urinal?). So…pretty much all I have that will work are digital photographs. Let’s face it, for me, photography feels too easy. I’m not sure if it’s the hands-off approach to the processing or the fact that I feel that my photography is inferior to my handmade objects or if it’s just that I would feel loathe to call myself a photographer. The complicated part for me is always, as usual, having enough patience to survive the inevitable pitfalls that come up when trying to run foreign objects (like watercolor paper) through the photo printer. Naturally I could not simply frame an image in the conventional fashion. I had to complicate the matter in an effort to make a statement that, probably, no one will get. I had to figure out how to remove the photograph from its natural environment: within a matted, glazed, perfectly square, black metal frame. All right, I do have to admit that I obsessed over the squareness of my frame: adjusting, checking, adjusting, checking. 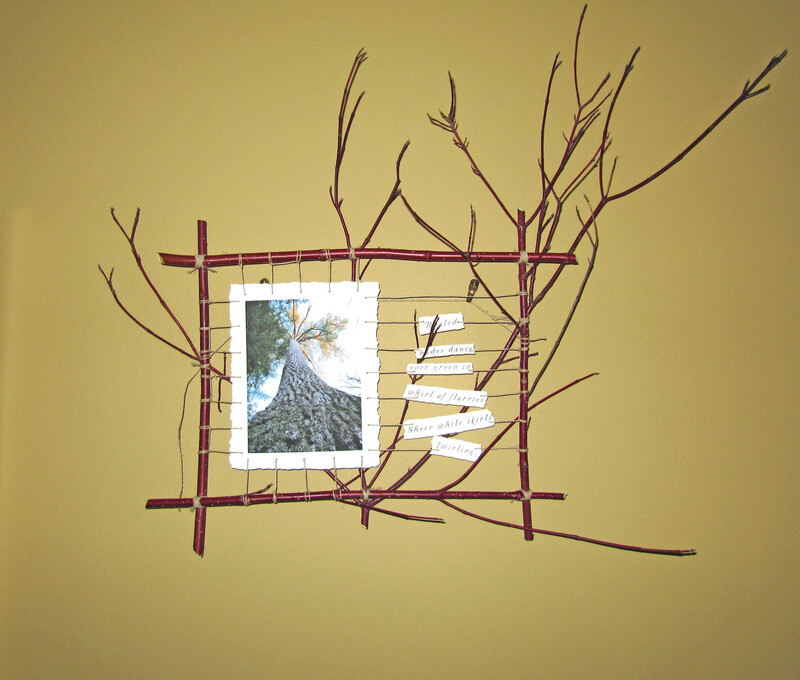 It’s about as square as a frame of lashed, native red osier dogwood twigs can be. Do you see where this is headed? Yes! I made my frame from a readily available, renewable resource that traveled one quarter mile from its source by foot to my home. And, hey, when I get sick of it cluttering up my studio, I can always start a fire with it or throw it in the compost pile. It’s the little things that count when you’re trying to buck the system. 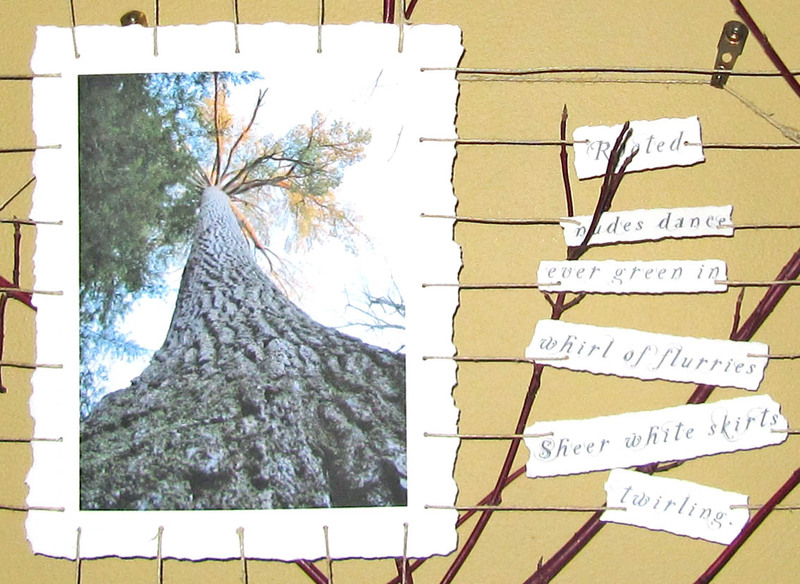 This entry was posted in creativity, Poetry and tagged collage, Haiku, winter. Bookmark the permalink. I LOVE this piece and the innovative way you framed it! You have A LOT of good points Rebecca! How can we better educate the public? Thanks, Laura. I like the way the frame became part of the piece: happy accident. How do we educate the public? I don’t know…maybe by living every moment of life as if it were art? This is so beautiful, Rebecca! It’s better than I imagined it when you first told me about it. Thanks, Lisa! The results were unexpected for me too. I tried some interpretive dance at work today. It didn’t go over well for me. The recipient of the message said they didn’t get contemporary dance and that that form of dancing isn’t much better than miming. I, myself, know some very good mimes and you know how much I love interpretive dance. I love this one also. Very Cool!! !